"The Wellness Approach: The Secrets of Health your Doctor is Afraid to Tell You," by Dr. Jonathan Spages, is a book about caring for your health before and after illness occur. The book covers a wide range of topics, from why we get sick to tackling allergies without drugs to losing weight. One of the strengths of the book is that it starts with the basics, such as how the body works and what is sickness. Once the reader has a grasp on the basics, Spages goes into more detail on preventing and treating illness in ways that are not conventionally taught to patients. Much of the book includes information on Pierce Results System, a new technique for addressing problems with the body. Spages includes many testimonials and examples in his writing, which makes it easy for the reader to understand the concepts. The book is quite comprehensive, even including information on how to prepare children for a lifetime of good health, but is approachable and easy-to-read. 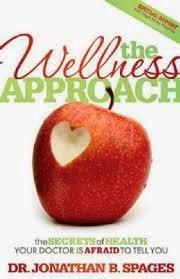 If you are looking for a book on alternative ways to treat and prevent illness, then "The Wellness Approach" is perfect for you.